Inglot D.S. 458 (available here) - $12 for the full size and about $5 as part of the Freedom System palette. Colour: A greyish-brown matte base with scattered golden (and purplish pink) sparkles. The different hues to the sparkles aren't really visible, though, unless it's a zoomed-in macro photo. How I use it: For an easy brown smokey eye, use a brown/black eyeliner pencil near the lashline, smudge, and use Inglot D.S. 458 as an all-over lid colour. Dab a shimmery eyeshadow only on the center of the lid to liven it up with a pop of colour. 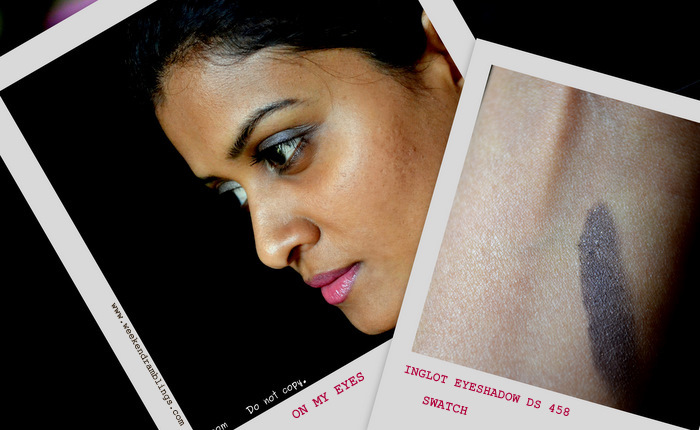 I rarely (if ever) use more than one eye shadow at a time, and that's how Inglot DS 458 generally gets treated. I can get away with using this as a brown-smokey eye or just as a dusting over the lids, but if you are lighter skinned you could also use this on the outer corner to intensify a lighter eye shadow. As you can see in the swatch, the sparkles aren't all that prominent out of the pan, and the matte base is what is more obvious. I haven't a fall-out issue with this eye shadow, but I won't use it to smudge close to the lashline - the sparkles do tend to fly and irritate the eye. I totally love Inglot shadows esp their refills, they are not only pocket friendly but quality and ranges is good and impressive! This shade you wore looks pretty on you! Rads the golden glitter you see in the refill is not much visible in the swatch na..
oh and ya dabbing shimmery e/s on the center of the lid would add to the oomph.. I toh always go wrong with black grey smokey eye looks...:P I need to practice more..hihihi..
Gorgeous shade <3 Looking great on you!!! Loved this shade sooooooooo much..